The University Library hosts its third annual Authors Celebration on Tuesday, Feb. 14 at 3:30 p.m. The free, public event honors the scholarship and creative works of HSU faculty, staff, students, and alumni published in the last year. HSU’s annual Authors Celebration takes place Tuesday, Feb. 14 at 3:30 p.m. in the University Library’s Authors Hall. Some of the many examples include CouRaGeouS Cuentos, a journal published by the the Department of Critical Race, Gender & Sexuality Studies, the Department of English’s student-produced Toyon literary journal, and John C. Schafer’s “Võ Phiến and the Sadness of Exile,” which profiles the life and work of one of the most respected writers in the Vietnamese diaspora. 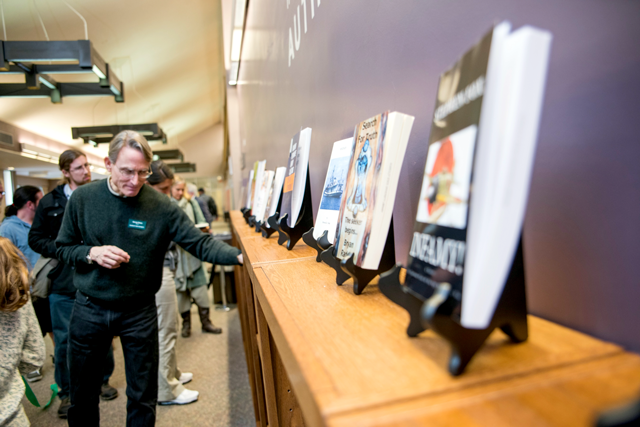 The HSU Authors Hall, located on the 2nd floor outside of the Library Fishbowl, is a permanent, physical collection of books, and a virtual collection of articles, CDs, and DVDs recognizing HSU faculty, staff, students, and alumni for their scholarship and creative work. Each spring, the Library celebrates works published during the previous year and adds to the bibliography of HSU authors who published their work in the previous year. For more information, contact the University Library at 707.826.3431 or library@humboldt.edu.